Kingmax, the leading memory manufacturer has launched the world's highest capacity waterproof SD card with 16GB. 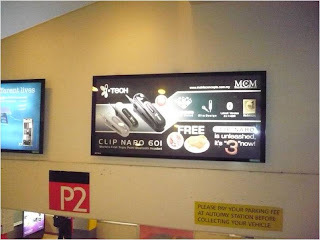 We made the first appearance during the DCIM photography fair at Midvalley Exhibition Center. Later we came out with the limited edition pack of free toothbrush holder, for the capacity of 4GB & 8GB. Taipei, Taiwan, Feb 2009, - KINGMAX, a global leading manufacturer and supplier of DRAM and Flash products, has announced the world highest capacity Waterproof SD card with 16GB. Based on KINGMAX patent PIP technology, the new SD card takes advantages in waterproof, dustproof and extreme weather performance. It plays as a guard to prevent the important information from accidents. KINGMAX Waterproof SD card provides more protections for users’ important data beyond the waterproof or shockproof functions from DSC. The new SD card adopts PIP technology inside, which has passed the waterproof test and receives IPX7 (Equivalent to JIS Waterproof grade 7) certificate from SGS. In addition, due to the unique packing technology, the new SD card also prevents the piracy. Moreover, KINGMAX Waterproof SD card has built-in ECC (Error Correcting Code) to detect and correct transfer errors and supports CPRM (Contents Protection for Recordable Media) mechanism to ensure the licensed contents could be duplicated safely. KINGMAX offers users a perfect choice to store all the treasured memories. 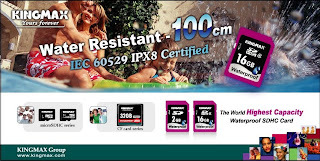 KINGMAX Waterproof SD cards are certified CE, FCC and BSMI standards. The new SD card also complies with RoHS, Halogen free and PFOS/PFOA directives. 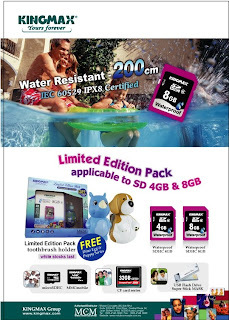 KINGMAX Waterproof SD card is available with 2GB, 4GB, 8GB and 16GB capacities and carries the global lifetime warranty. The KINGMAX group is committed to the development, production, marketing, and after-sales service of DRAM and Flash products. In consistence with high quality and high-level performance which the brand “KINGMAX” adheres to, the company further provides consumers with optimal, comprehensive products and has been upgrading Taiwan’s digital storage industry since its establishment. For our products, we offer such friendly and efficient product services technical support, and website resource sharing, in addition to the free “lifetime warranty” service. 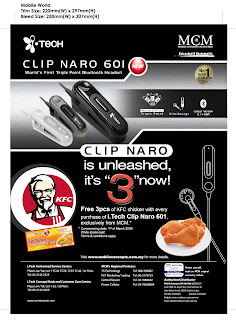 MCM had done the KFC campaign once to reward the faithful i.Tech & MCM supporters. We did the same thing, just a lot better this time! Now with every purchase of i.Tech Clip Naro-601, you will get one voucher redeemable for 3pcs of KFC chicken. The promotion is valid nationwide (with T & C apply, while stocks last). The advertisements on Ering and MobileWorld magazines. As well as 3 months exposure on two lightboxs at KLCC. "3" has a new definition!